A modern Flight Management System (FMS) is one of the most complex, yet vitally important components of a modern cockpit. In today's crowded airspace, it is critical that pilots accurately enter all the necessary flight plan data. 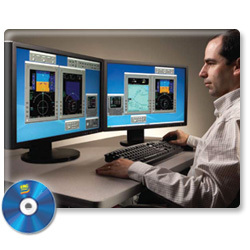 The Rockwell Collins Avionics Pro Line FMS desktop trainer is ideal. Pilots can enter all the data for a real flight plan using either single or dual FMSs. Since the simulation uses the same software as the aircraft's FMS, pilots have accurate data they need including navigation, performance, V-Speeds, and more. This FMS trainer also features representations of all control panels, displays, and non-avionics controls like throttles to practice and master complicated cockpit automation tasks. To confirm their data entries, pilots run a simulation and can watch as that flight is completed from takeoff to touchdown. With Rockwell Collins Avionics FMS, you train like you fly Rockwell Collins Avionics FMS desktop trainers are aircraft specific. So the software package you buy is the same as the equipment you have in your aircraft, which greatly enhances the training experience.